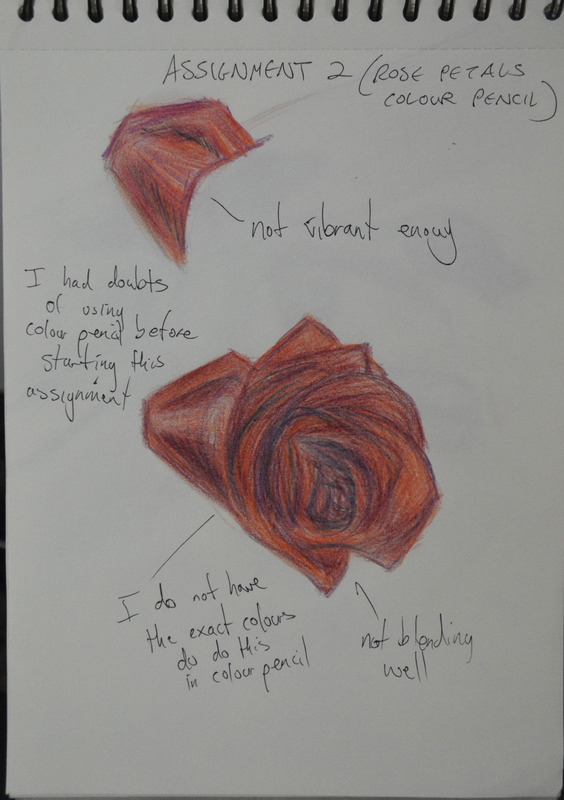 An understanding of the use of colour in drawing. An understanding of the most appropriate choice of medium for the subject and skill using it. Accuracy and a demonstrable understanding of tone. The last month was a month of heartache and arguments breaking up with the girlfriend of two years and although it did slow me down with my coursework and delay my assignment it was inspiring. The now ex-girlfriend left a dead rose at the side of the bed, one that she had saved from our first valentines day together, it did go straight in the bin on the day she left but it gave me a great idea. 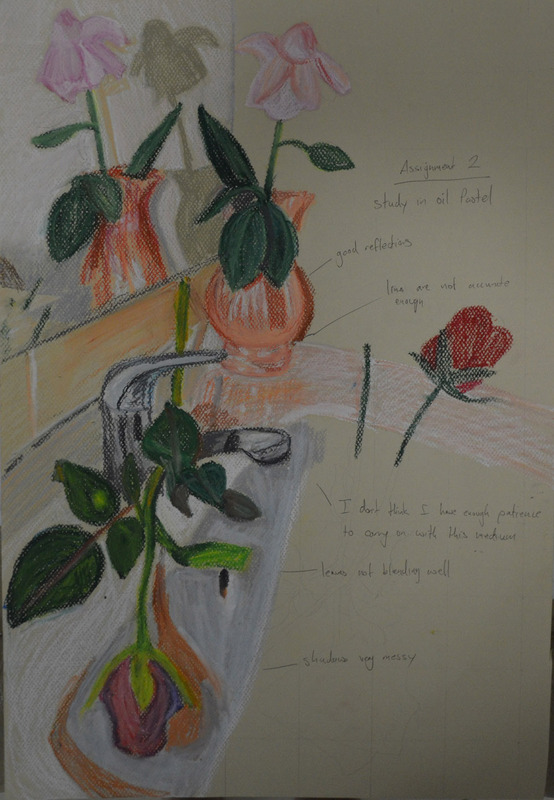 For this assignment I planned to buy some roses to and throw them in the sink and draw them where they landed (using the sink was an idea I got from my research on Antonio López García, recommended by my tutor). I went to a small florist in the department store where I work, they had a disappointing selection of roses so I purchased two small red roses a pink rose and a larger red rose all of which had had their thorns removed, which was also quite disappointing. 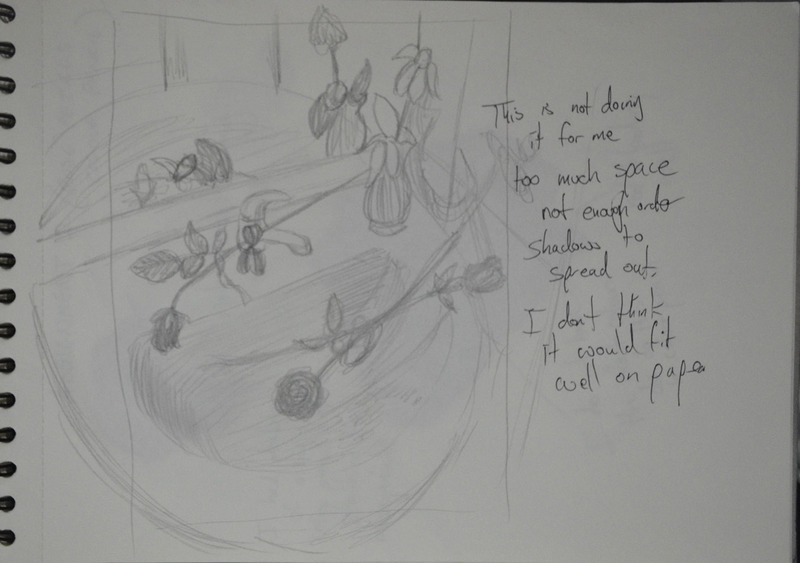 When I finally got round to drawing the flowers the pink rose was on it’s way out and the petals were now pointing down and didn’t look much like a rose, the two small roses had opened up, but not too much and the large red rose was in full bloom; these changes gave me a nice variation of shapes to draw. 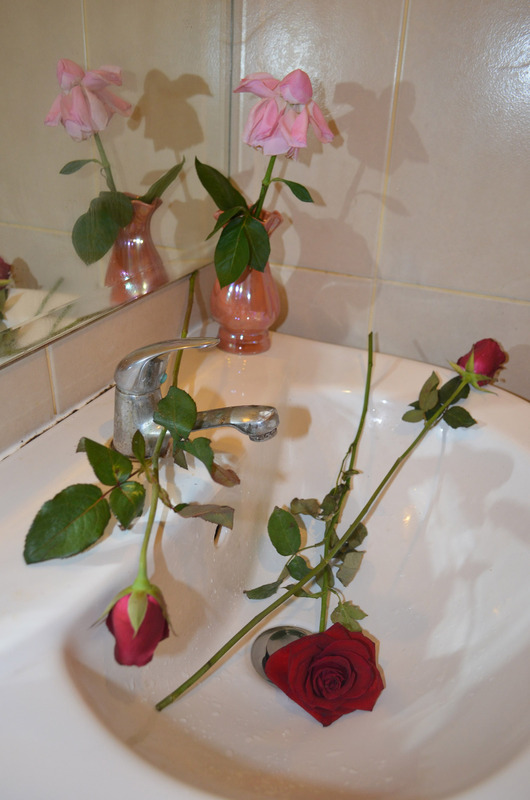 I started off by setting up the roses in different positions around the sink and using a view finder I decided that the stem of the pink rose was too big and so I snipped it to bring the flower closer to the vase. It took me a good twenty minutes to find some decent compositions to draw, throwing them in the sink and drawing them as they fell was just not going to work! I made a few preliminary sketches in my notebook and decided that the paper had to be in a portrait position rather than landscape in order to concentrate on the natural objects in the drawing rather than the objects surrounding them. 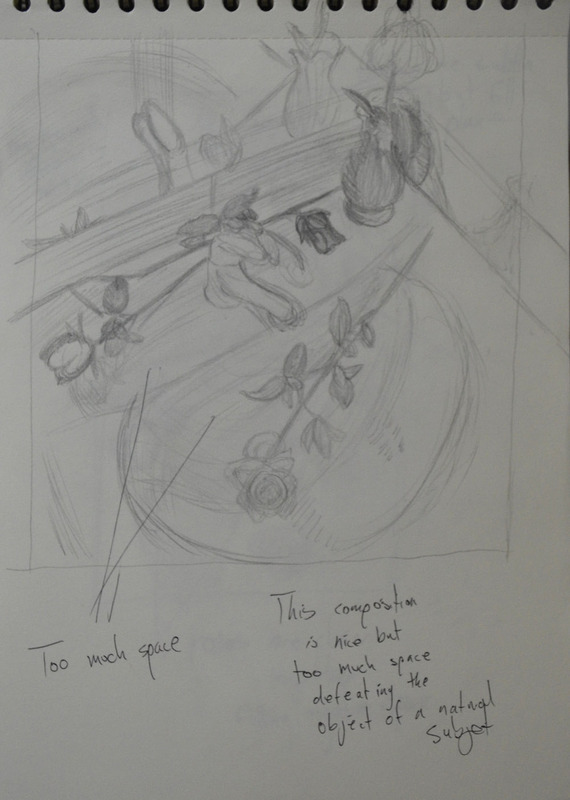 After completing the preliminary sketches I chose the composition that I thought would work best and developed it for enlarging. 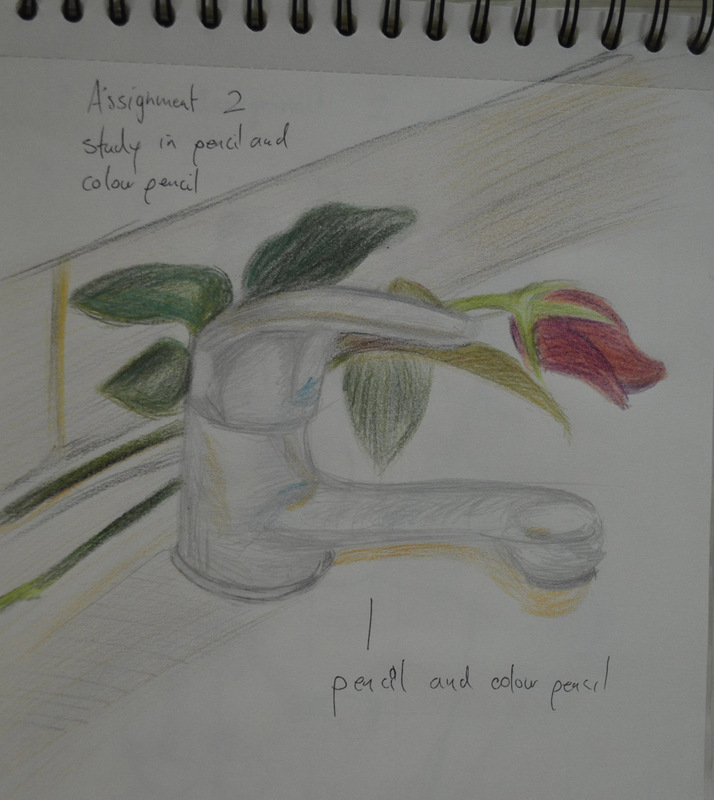 Up until this stage I was positive that I would be producing the final drawing for this assignment in coloured pencil and so I did a colour pencil sketch of the rose flowers and then a pencil and coloured pencil sketch of the tap and rose leaves in my sketchbook. Here, it was clear to me that they would be no good for this assignment and I would after look at other mediums. I went out and purchased a pack of 24 Derwent Pastel pencils and 1 x A1 sheet of fawn coloured pastel paper and 1 x A1 sheet of cream coloured pastel paper. 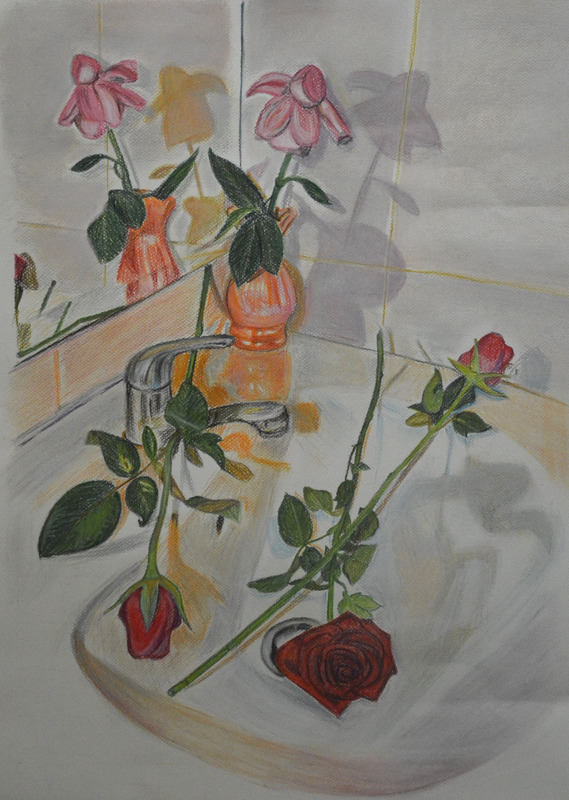 I did not know yet which kind of pastel I would be using for this assignment or whether or not it would be good to draw on dark paper and go lighter or lighter paper and go darker, I just knew that I would be using pastels and that coloured paper was best for the coloured tiles in the bathroom. I decided that it was best to use the lighter paper and go darker and so I would use the darker paper for two more colour studies one in oil pastel and one in pastel pencil. I tore the A1 size paper into two halves and did two almost identical enlarged drawings and decxided to do the first drawing in oil pastel. There were parts of the drawing that would have been good in this medium but other parts I decided would just not work, I wasn’t prepared to mess up in my final drawing with a sloppy medium when the brief said I should be focusing on accuracy and so I refused to complete the full drawing wasting more time. The second study in pastel pencil worked a lot of better and at some stages of the drawing I actually thought that I could submit it for more my final drawing and so I spent a few hours completing it. 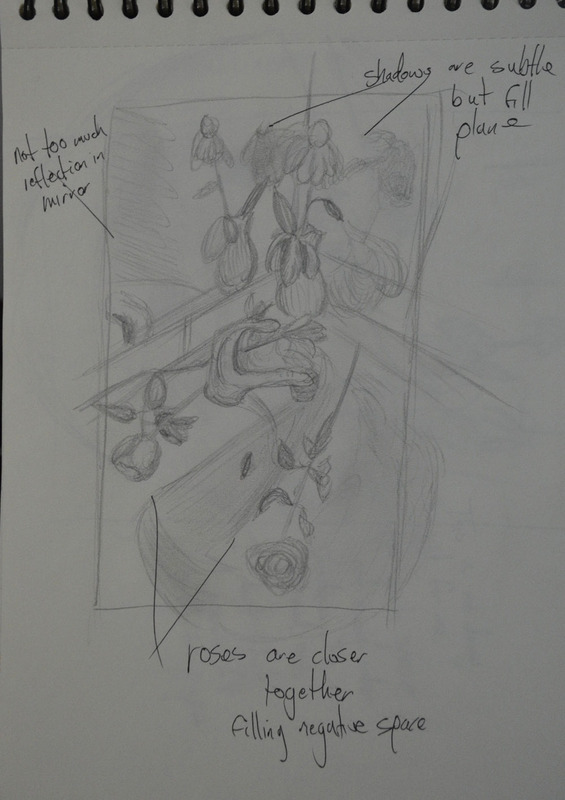 Towards the completion stage I realised that the flowers were too close to the edge of the paper and the perspective of the flower laid across the top of the open rose was way out but completing the drawing helped me to decide on the different techniques I would use on the different subjects in the drawing. 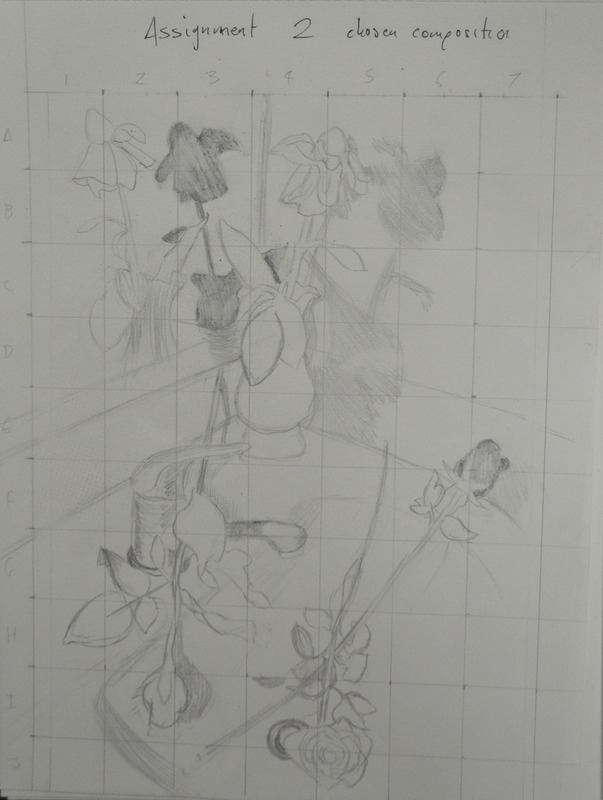 By the time it came to work on my final drawing the flowers were long gone so I was working from a photo again. I decided that vthe composition still needed further development and so I put a photo of the original composition into Photoshop and used Photoshop’s guides to help me perfect the enlargement for my final piece on the cream sheet of A1 pastel paper. With pressure now on final piece I wasn’t prepared to mess up and so there is a lot of white showing through in certain parts of the drawing which I left for the sake of overworking and messing up. I decided that in the final piece I would not only use pastel pencil but also hard pastel as I could cover bigger areas with the flat of the sticks of pastel. The only problem with this was that it was hard to layer the white over the darker colours and so I did mess up in certain parts of the shadows. Above everything I think I did very well in demonstrating the use of colour in drawing. Before this part of the course I would have probably used several colours on each piece and kept ‘trying’ throughout the drawing. In this assignment I started off with the lightest colours layering the darker colours over the top and got the results that I wanted. Apart from regretting using hard pastel in places, I think I did well choosing the right medium for this drawing. 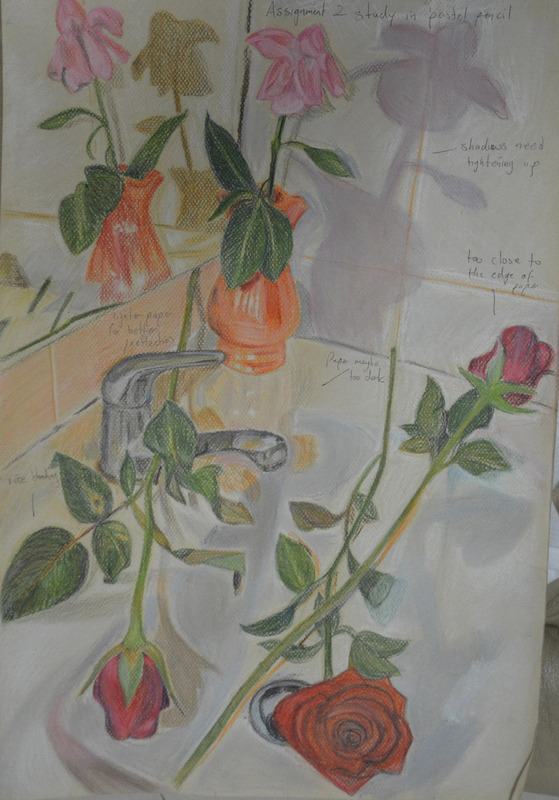 With the subtle shadows and colours reflected off the sink and the deep reds in the flowers, Pastel pencil was the best choice. The ability to set up an interesting composition. Absolutely! And I am positive it shows in this assignment. There are aspects of this drawing where I could have done better in all three of these categories but overall I think I did very well to show what I have learnt in the first two parts of this course, mark-making, depth, contrast and tone. I really try to focus on accuracy at all times, I do think that I have shown accuracy and a demonstrable understanding of tone in this assignment however being modest I still have to say that there is most definitely room for improvement.